Bruno Latour, the French sociologist, anthropologist and long-established superstar in the social sciences is revisited in this pioneering account of his ever-evolving political philosophy. Breaking from the traditional focus on his metaphysics, most recently seen in Harman’s book Prince of Networks (2009), the author instead begins with the Hobbesian and even Machiavellian underpinnings of Latour’s early period and encountering his shift towards Carl Schmitt and finishing with his final development into the Lippmann / Dewey debate. Harman brings these twists and turns into sharp focus in terms of Latour’s personal political thinking. 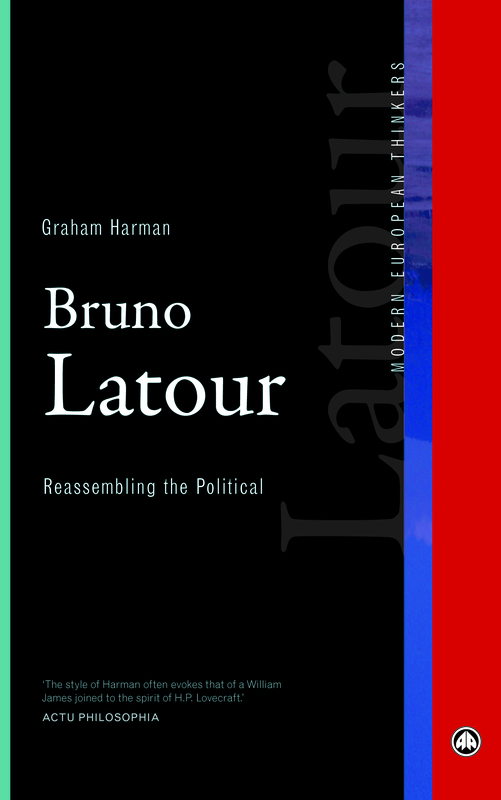 Along with Latour’s most important articles on political themes, the book chooses three works as exemplary of the distinct periods in Latour’s thinking: The Pasteurization of France, Politics of Nature, and the recently published An Inquiry Into Modes of Existence, as his conception of politics evolves from a global power struggle between individuals, to the fabrication of fragile parliamentary networks, to just one mode of existence among many others. Graham Harman is Distinguished University Professor at the American University in Cairo, Egypt. He is the author of numerous books, including Tool-Being: Heidegger and the Metaphysics of Objects (2002) and Prince of Networks: Bruno Latour and Metaphysics (2009). You are currently browsing the ANTHEM blog archives for November, 2014.